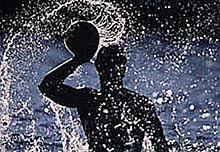 Here are the winning images from the first Sport Shooter Photo Contest. Wayne Shipman from Eastman Kodak. Thomas Muster pauses during an unfortunate incident during his semi-final match against Greg Rusedski at the Newsweek Champion's Cup in Indian Wells, CA Saturday, March 14, 1998. SF Giants J.T. Snow lays at home plate after scoring the game winning run against the Houston Astros in the bottom of the ninth inning of the Giants home opener on April 7, 1998. Fans reach out to a Los Angeles Galaxy player as confetti falls after a win at the Rose Bowl. Juan Vega (center) of Poly High scored two goals against Reseda High in this game but his most spectacular play came on an attempted bicycle kick between two Reseda players. Adam Gould(left) of the Mathieu Martin Matadors gets tackled by J.M.A. 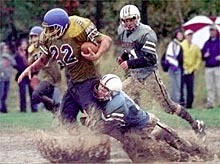 Armstrong Cougars' Kirk Lewis in the fourth quarter during a very wet football game in Salisbury, New Brunswick, October 17, 1998. 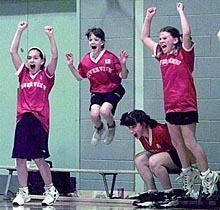 The Riverview Royals bench reacts to a point in the final moments of their game against the Miramichi Magic for their third place win in the New Brunswick mini AAA Tier 2 basketball championship at Moncton's Edith Cavell School in March. University of Portland soccer players in defeat after losing in 4 overtimes with 20 seconds left to North Carolina in NCAA soccer semifinals. A pass to Dallas' Billy Davis is broken up by New York Giants defenders Phillippi Sparks and Percy Ellsworth in the third quarter at Texas Stadium. Missouri's John Dausman dives for a last minute catch against Nebraska in the Tiger's loss to the Cornhuskers. 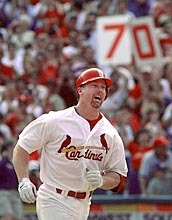 A jubilant Mark McGwire rounds the bases after hitting his record 70th home run on Sunday, Sept. 27, 1998 in St. Louis.